We provide our customers with high quality services personalized for their unique needs. We are always available to help you with all your electrical problems or projects. 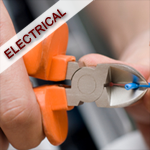 Our electricians are professional, courteous and efficient. We also provide a variety of electrical commercial services. We offer 24 hour emergency service & are experienced in all types of electrical systems. Our technicians are very knowledgeable & will assist you with any problem or project in your business.